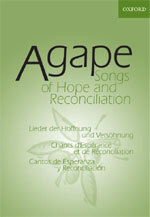 In preparation for its 2003 Tenth Assembly in Winnipeg, Canada, the Lutheran World Federation is producing a new international, ecumenical songbook, "Agape," which will not be restricted to the Assembly’s use. The songbook is being published by Oxford University Press in England, making its variety of music from all corners of the globe widely available for purchase by churches, other groups and individuals. "The songbook is a Lutheran contribution to the ecumenical and liturgical movement. It is my hope that after the Assembly it will be used worldwide at Lutheran and ecumenical gatherings as well as in local multicultural settings. The songs have been collected and selected by a number of representatives from the LWF member churches and ecumenical organizations", says Rev. Dr Ishmael Noko, LWF General Secretary, in his Preface to the New Assembly Songbook. The Assembly Songbook will contain over 100 songs from around the world (Africa 16; Asia 20; Latin America and Caribbean 20; Europe 27; North America 15; plus classics 5) and will include liturgical selections such as kyrie, gloria, gospel acclamation and affirmation of faith. The songbook will also include an index for liturgical music and an index of biblical references. > Click here for music score & lyrics for the song "May Your Breath of Love" which was written especially for the Assembly by Maggie Hamilton. She points out that in music, like in other fields, so many things are called "love" that the word is in danger of losing its meaning. > Click here for comments from and information on Maggie Hamilton.